← How to convert a document of html to png image? Many facsimile and document imaging file formats support a form of lossless data compression often described as CCITT encoding. The CCITT (International Telegraph and Telephone Consultative Committee) is a standards organization that has developed a series of communications protocols for the facsimile transmission of black-and-white images over telephone lines and data networks. Group 4 is a protocol for sending fax documents over ISDN networks. In brief,CCITT Group4 is a kind of compressing algorithm which can compress monochrome images in a smaller size. 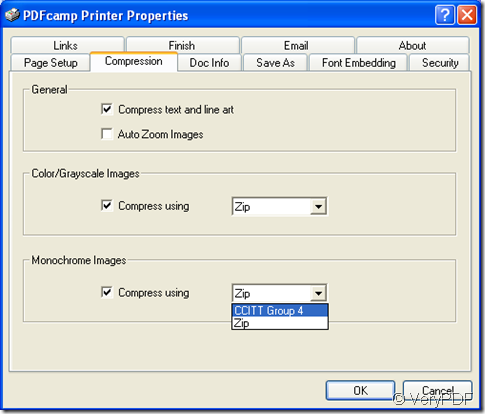 If there are many black-and-white images in your document which you want to print to pdf file,it will be a big size generated file after conversion.So the best way is to compress them into a smaller size one by some algorithm.In PDFcamp Printer,you can compress all black-and-white images through CCITT Group4 algorithm and you can master the way by following me. 1.Open your file and press “file” and “print”. 2.In properties you should find the item”Compression”.In Monochrome Images(black-and-white)item please check “compress using”and select CCITT Group 4 in the dropdown list beside.Then click”OK”. 3.Save and name your generated file. 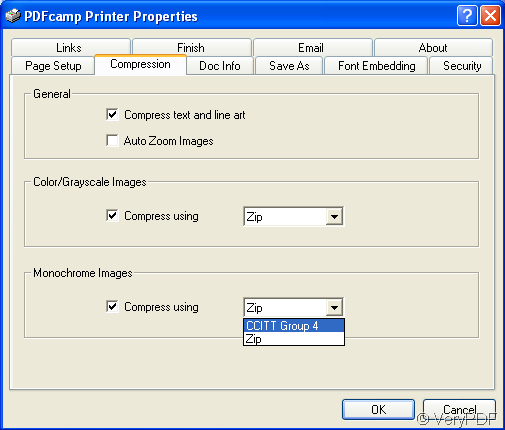 If there are a lot of black-and-white images in your original file,the compressed generated pdf file will be smaller in size than the uncompressed one by using PDFcamp Printer. How to print JP2 file to PDF file?